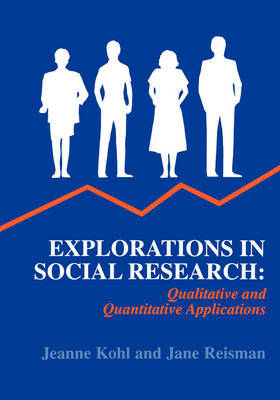 Explorations in Social Research: Qualitative and Quantitative Applications offers real-life research examples and exercises. The book aids instruction by offering students more opportunities for hands-on practice in conducting and applying social science research than they are likely to find with only a standard research methods text at their disposal. The text offers three types of field-tested exercises: Research Briefs, Tools and Data, and Applications (mini-projects). They can be used as graded assignments, as in-class exercises, and/or as discussion material. * The Research Briefs are concise summaries of studies that illustrate various research topics and approaches. They present challenges typically encountered and show how researchers have overcome these challenges. Each Research Brief is followed by assessment questions designed to encourage students' critical thinking. * The Tools and Data sections focus on the "nuts and bolts" of research. They illustrate the use of various research tools, such as data collection instruments, questionnaire items, and requests for proposals. Assessment questions follow. * The Applications are mini-projects that allow students to carry out and then evaluate research activities. The project-oriented approach of these applications supplies a dynamic learning tool. Instructors will find it easy to adapt Explorations in Social Research to their needs because the chapters are self-contained units. They can be assigned in any order, according to the design and emphasis of a particular course. In addition to quantitative and "basic" research studies, this text includes many examples of both qualitative and applied research. This approach allows instructors to provide a broad introduction to the social research field or to be selective in emphasis. Furthermore, the text integrates gender, race, social class, and ethnicity as it explores research topics, variables, and populations. Three sub-themes are integrated throughout the book: * how bias can affect the research process; * methodological difficulties and the importance of ethics in working with human subjects; * how notions of common sense can both be a guide to and interfere with the process of scientific investigation. Explorations in Social Research also features original interviews with well-known sociologists and social researchers, including Pauline Bart, James Davis, Howard Becker, Peter Rossi, James Coleman, and Maxine Baca Zinn. The book's conversational writing style helps to break down some of the learning barriers so common among students taking this course. The perforated pages for exercise questions provide a convenient way for students to submit assignments. Suggested answers to all assessment questions are listed in the accompanying Instructor's Manual.